My rating: 8.5/10. Michael Kors MK5353 watch. Ladies chronograph timepiece. Hello, today I’m doing a Michael Kors MK5353 review. This is another elegant looking ladies chronograph timepiece. It has a glitzy finish to it with the gem studded border and hour markers. I hope you enjoy this Michael Kors MK5353 review below. The whole watch has this glitzy design to it especially with the sparkling stone set bezel on display. The chronograph dials showcase a 30 minute, date, and 24 hour display. The dial itself is finished in a soft pink colour to match up with the bracelet links. 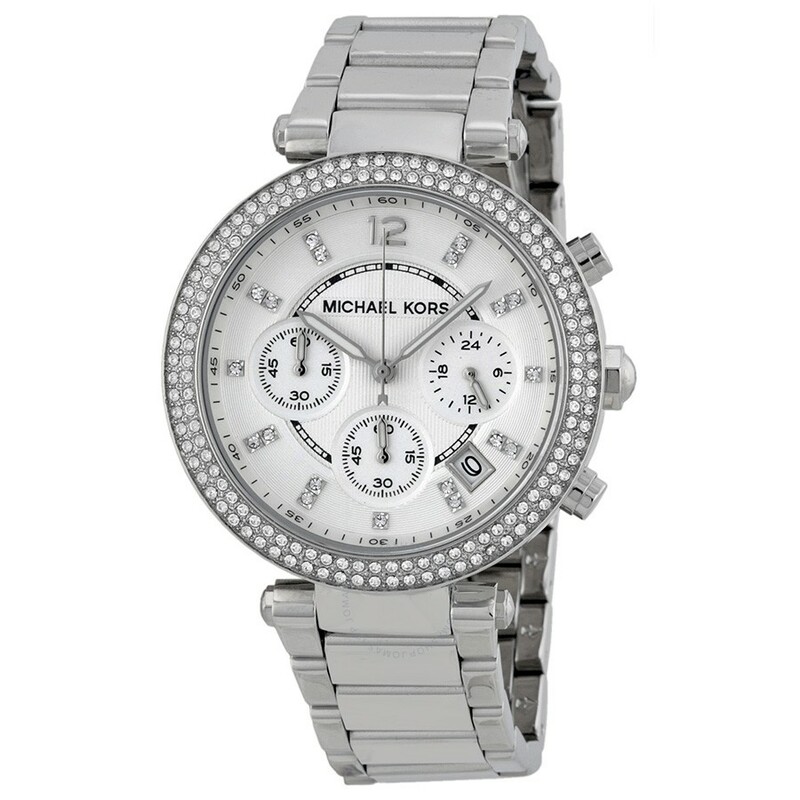 This timepiece from Michael Kors features a specially hardened mineral crystal glass. This type of glass is found on many watches in the price range and offers a good level of scratch and knock resistance. At the heart of the MK5353 is a reliable Japanese quartz movement. Michael Kors use these quartz movements in many of their watches, they’re accurate and require very little maintenance. The 39mm casing diameter makes this quite a large women’s watch. It has a thickness of 12mm which is a standard thickness. These larger watches have been quite popular lately for women. The strap is a fairly plain stainless steel with a nice fold over push button release clasp. It measures approximately 18mm in width. This Michael Kors watch actually has a pretty good water resistance rating. A 100m or 10 bar rating makes this watch suitable for recreational surfing, swimming, snorkeling, sailing and water sports. Band: Stainless steel strap, standard length, 20mm width, fold over style clasp. Case: Stainless steel casing, sizing diameter: 39mm and thickness: 12mm. Dial: Analogue display. Mineral crystal glass window lens. Water Resistant: A water resistance of up to 100m / 10 bar. As with any watch that is this highly decorated with stones, you run the risk of them falling off over time, especially with this many of them. This is a popular Michael Kors women’s watch which features a really impressive 100m water resistance rating, not something I was expecting on this style of watch. Overall it’s a nice glitzy timepiece that’s quite fairly priced from such a hugely popular brand. After looking into the watch design, quality, features, and pricing this watch received a 8.5/10 from us at The Watch Blog. Hope you enjoyed this Michael Kors MK5353 review. Find more watch reviews below.